I don’t know about you but every time I smell Oil of Olay, the memories of my wilita come rushing back. Lord rest her soul she swore by it but when creating our moisturizer I wanted to create a moisturizer that would create that same nostalgia but eliminate toxic or synthetic ingredients. Our Acai Age Defense Moisturizer is a light weight, hydrating moisturizer that deeply penetrates your skin using only the purest ingredients. 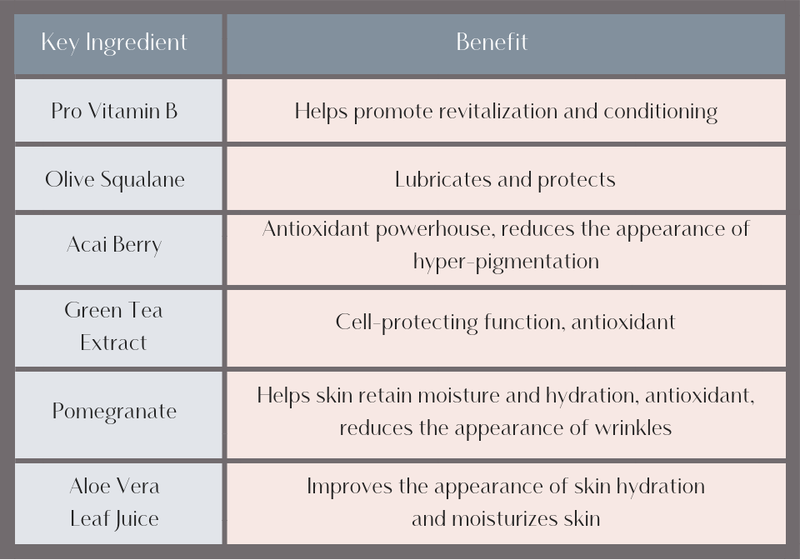 Pro-Vitamin B helps your skin feel soft, smooth and healthy. Olive Squalane conditions and Green Tea Extract acts as a shield against environmental aggressors creating the perfect balance between your skins lover and protector. We knew you wouldn’t be able to leave your home without it so we have a 0.5 oz. travel size and 1.7 full size available. Ingredients: Water, Aloe Vera Juice, Shea Butter, Grapeseed Oil, Fractionated Coconut Oil, Olive Squalane, Vegetable Glycerin, Natural Vegetable Emulsifying Wax, Vegetable Stearic acid, Acai berry Powder, Bilberry Powder, Blueberry Powder, Pomegranate Powder, DL Panthenlol (Pro-Vitamin B), Green Tea Extract, Silver Dihydrogen Citrate, Citric Acid, Natural Berry Scent. Directions: Apply daily on a cleansed face before your makeup application and at night before you go to bed. Use our Activated Charcoal or Purple Brazilian Clay Facial Soap Bar daily before moisturizer. Or if it’s a special night (1 to 2 times per week) after you exfoliate with our Acai Berry with Rosehip Seed oil Face Polish. And if you’re a savvy shopper like I know you are we’ve combined our moisturizer and face polish in our La Cara Ritual for $10 off when purchased together.